Eureka Springs Arkansas has become one of the nation’s leading wedding destinations for many reasons. One is the fact that Thorncrown Chapel is sculptedinto the forested landscape of The Ozarks here in Eureka Springs AR. Another is that Eureka Springs is legendary for its sense of romance, a place like no other. But perhaps the most compelling reason for Eureka being the “Wedding Capital of The South” is that beautiful brides can proudly invite their friends and family to their special event inside a castle. The 1886 Crescent Hotel and Spa is a four-story, Victorian-style resort created from blocks of native limestone atop one of the highest point in all of the Arkansas Ozarks, a castle in the truest form. Picturesque and picture perfect… the ideal setting for your special wedding event. 2009 choice Platinum Award Winning Hotel and currently ranked #1 in the nation. Welcome to Springfields newest Holiday Inn Express & Suites Medical District hotel. Located in SW Springfield, off South Campbell & James River Freeway (Hwy 60), we are minutes away from the original world famousBass Pro Shop, Battlefield Mall, Springfield/Branson Regional Airport (SGF) & a short drive from Silver Dollar City & Branson entertainment. 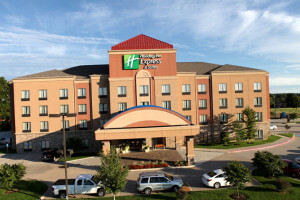 As our guest at the Holiday Inn Express & Suites hotel in Springfield enjoy our spacious rooms with sleeper sofa, microwave, refrigerator, flat panel TV, free wireless high speed Internet & equipped with a heated indoor pool & hot tub, business center, guest laundry & sundry shop. The hotel features select suites with rain head shower heads. Start your day with complimentary hot Express Start Breakfast. Banquet space for 2-200 people. Great location for bridal showers, rehearsal dinners or receptions. At the Marriott Residence Inn Springfield, we’ve perfected the extended-stay experience by combining the comforts of home with our passion for making every guest feel welcome. We are conveniently located in South Springfield near Cox and St. Johns Hospitals, McKesson, Noble, MSU, Drury University, Evangel University, Bass Pro, Grizzly, Battlefield Mall and only a short drive to Branson Missouri. Our 136 suites offer separate living and sleeping areas with fully equipped kitchens. Spread out in our one or two-bedroom suites, many of which have balconies and fireplaces. All of our suites have free high-speed wireless internet. Start your day with a free hot breakfast buffet and join us for complimentary weekly barbecues, evening hors douevres, and many other home touches. Take advantage of our seasonal outdoor pool & spa, indoor heated spa, fitness center, & sport court. Residence Inn caters for up to 100 guests with 2400 sq. ft. of flexible meeting space and state of the art audio visual equipment.